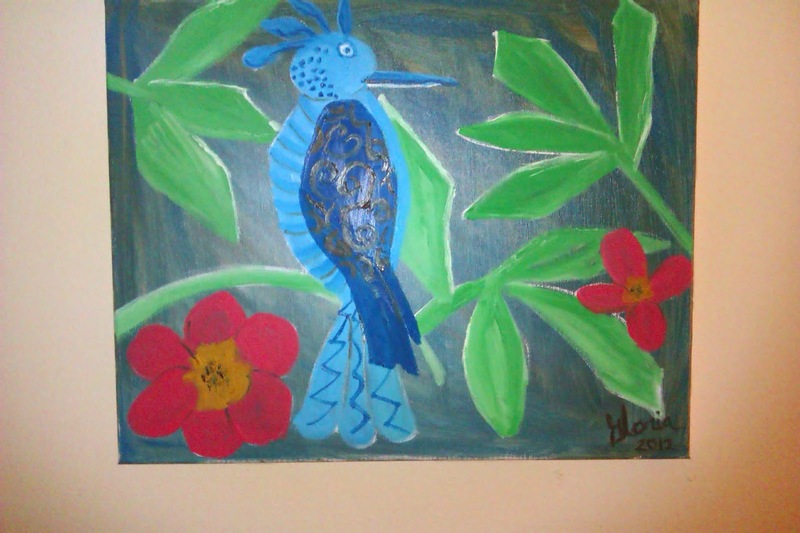 I, Gloria Poole, residing in Missouri but born in state of Georgia in USA, drew, painted, signed, photographed, uploaded all of this art to this blog of mine. See labels beneath each . 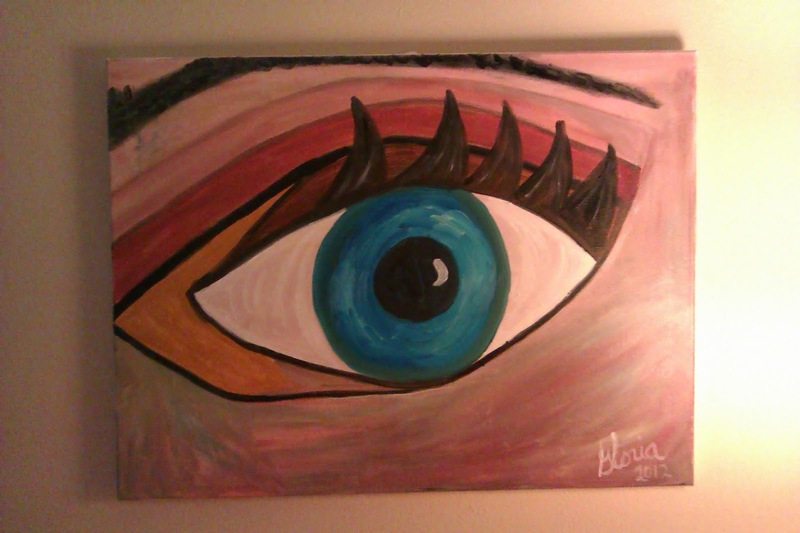 Copyrighted art and blog. See notice. 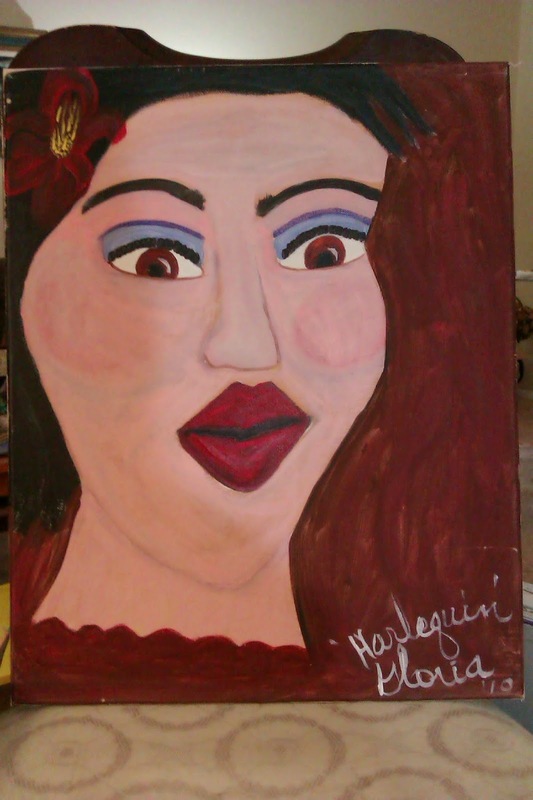 "Harlequin" oil painting on canvas, by Gloria Poole, yr 2010. I photographed this setting on dining room chair. 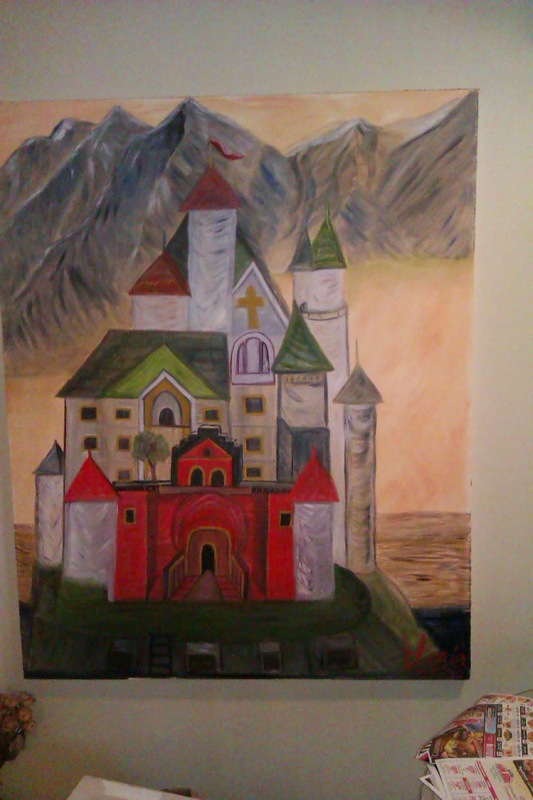 "The Schloss" oil painting on canvas by Gloria Poole of Missouri [but I painted this when I lived in zip code 80203. Read my blog in my former married name at https://gloriapoolepappas.blogspot.com for more on those horrible years in Colorado. I divorced a second time after 4 horrible years and many injuries caused by then-husband DBP and divorced DBP in Arapahoe County Colorado and removed the hated Pappas name from my name forevermore at final decree of divorce from male DBP in Oct 2007 and resumed my full maiden name including my born with surname of Poole at the same time. 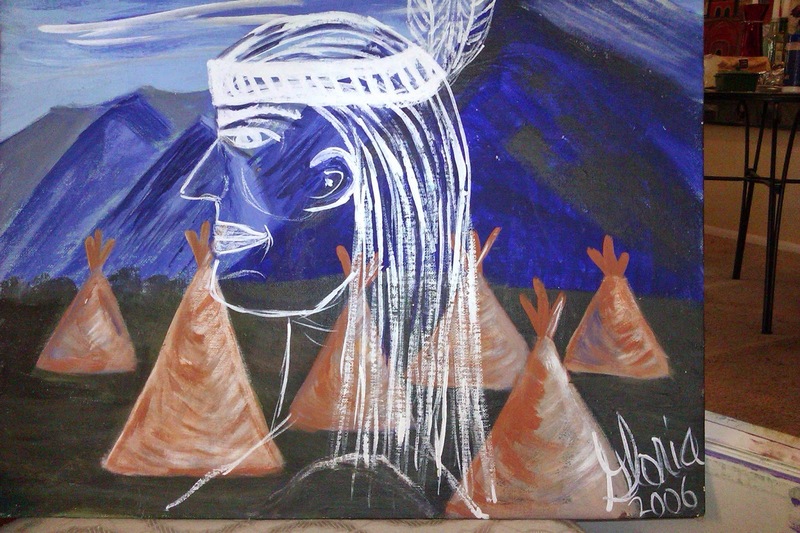 I moved to Missouri Oct 31, 2009 with the art I had in my possession that I had created.] 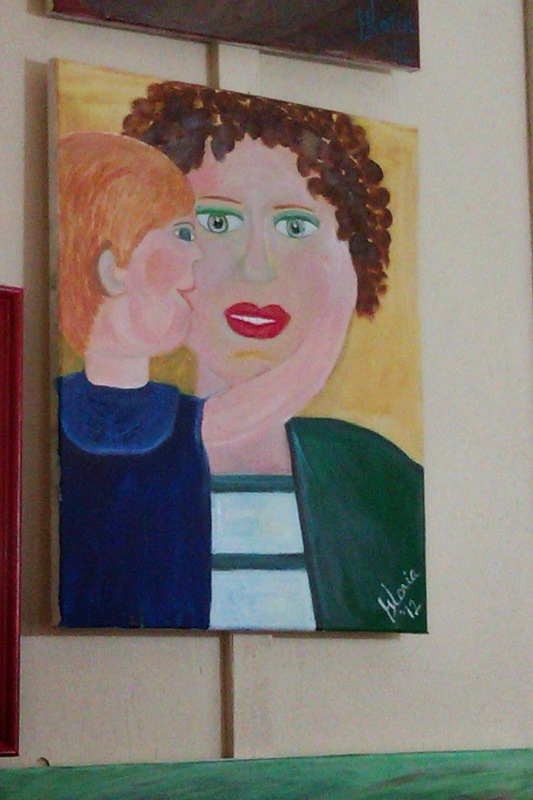 I moved this painting with me and it is on my dining room wall now. It is 4 ft across and six feet tall on canvas. 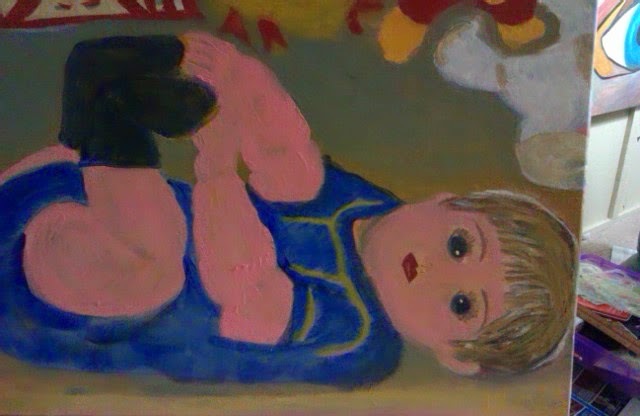 Micah [from Bible about the wicked perishing from the land] ; oil on canvas by Gloria Poole, yr 2006 when I lived in Aurora Colorado as wife of male DBP. See above statement for info. 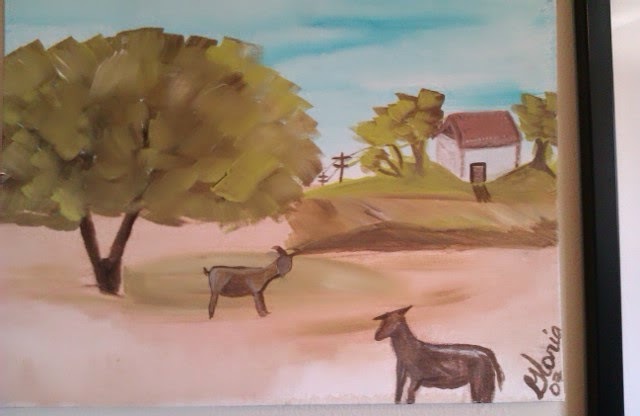 "The farm" oil painting on canvas board, by Gloria Poole; yr 2007. 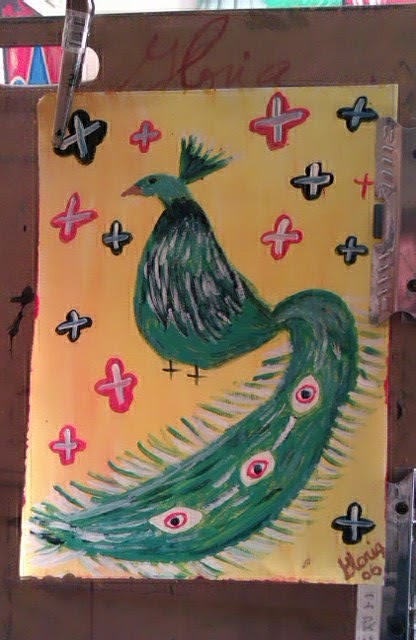 "Peacock" in abstract acrylic on paper, by Gloria Poole of Missouri, but I drew and painted this in yr 2006 in Aurora Colorado. See statement above for more about that horrible year of my life. I am updating this this evening because criminals tried to hijack an email of mine in their effort to steal blogs of mine that I display art on. I have emailed the @FBI to get their help with removing criminals in Colorado [or anywhere] from auto-logging into my accounts via fraud, treachery and I D theft. Copyright Notice: this blog and all content, all words, all photos, all art belongs to me Gloria Poole residing in Missouri but born in state of Georgia, and only to me. I absolutely own all rights to this account, to this blog, to this art and to my name and to my content I have created in any form, at any location, for any reason, with any tool or method, whether or not I display it anywhere or did display it anywhere, or photographed it or not. I have not ever waived my copyrights, nor have I ever sold any of the art displayed on this blog. I have the art that is displayed on this blog in tangible form and I own it absolutely as creator of original content. This blog may not be transferred to anyone anywhere, nor be saved to disk, nor photo-copied, nor screen-captured, nor downloaded, nor printed at remote, nor have domains forwarded to it that do not belong to me. This blog and all content on it is covered by U S Copyright law and I, Gloria Poole, own all rights to it. For the record: I, Gloria Poole, am a white, single again, twice-divorced Southern Baptist Christian woman and the natural mother of two and only two grown daughters who are Jennifer and Leigh but no sons or other children. I am also a Registered Nurse licensed in Missouri [but before that for most of my life, in the state of Georgia], and am an artist in all mediums, a poet, author, citizen journo, blogger, writer, photographer, cartoonist. illustrator, republican, prolife activist, personhood amendment promoter, and U S citizen by birth. Copyright; Gloria Poole ; Gloria ; gloria-poole ; gloria0817 ; gpoole817 ; artist-gloriapoole; Ms. Gloria Poole; Gloria Poole, RN, artist; G-L-O-R-I-A; g-l-o-r-i-a ; gloria.poole; @gloriapoole ; @gloria_poole ; gloria_poole ; gloriapoole.RN; and other variations of my real, born with, legal name of Gloria Poole, at my own, private apt in Missouri which is not shared with anyone [meaning no one is authorized to login at remote] , on 8 August, 2014 at 8:46pm.